Tokyo Governor Yuriko Koike attends a news conference to announce the name of new political party at Tokyo Metropolitan Government Building in Tokyo, Japan September 25, 2017. TOKYO - Popular Tokyo governor Yuriko Koike announced on Monday she would lead a new political party into national elections expected next month, hoping to repeat her success in local polls. 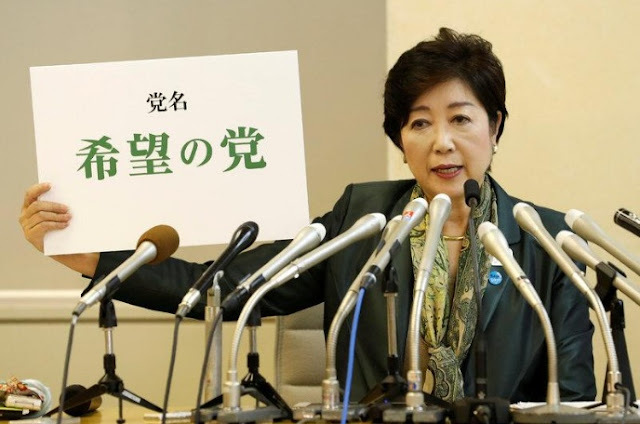 Former TV anchorwoman Koike, 65, launched the new party called "Kibo no To" (Party of Hope) just hours before Prime Minister Shinzo Abe was expected to call a snap election for as early as October 22. "I'm launching a new party and I want to be directly involved in it," Koike told reporters, adding that she will remain as Tokyo governor while becoming the head of the new party. "Japan is facing a difficult time considering the situation in North Korea. Economically, the world is making a big move while Japan's presence is gradually declining," said Koike. "Can we continue letting (the existing lawmakers) handle politics?" Koike, who spent nearly two months as defence minister in Abe's first cabinet in 2007, quit the LDP in June to lead the newly-formed Tomin First no Kai (Tokyo Residents First). This party humiliated Abe and the LDP in local elections in July but commentators say she has not had time to create the necessary foundations at national level. Abe's conservative LDP party is seen as clear winner of a national vote, with a recent survey showing 44 percent would vote for the current prime minister compared to eight percent for the main opposition Democratic Party. Popular Tokyo governor Yuriko Koike announced on Monday she would lead a new political party into national elections expected next month, hoping to repeat her success in local polls.